When we first started using Intercom, we were onboarding 5-10 new users per day. With our “all hands” approach to support, it was easy to quantify issues and feature requests that were coming up in support chats. But that didn’t last long. As we continue to scale, we’re now onboarding 250+ new users per day, and chats have climbed to 30 or 40 per day. Along the way, it’s become a lot harder to quantify and truly internalize trends in user feedback as these numbers continue to grow. This tool was designed in order for us to better evaluate which areas of our product need to be worked on. During development, we realized that the support for this kind of system was not all there, and that no one else had publicly released a tool which makes this sort of thing easy to build, so we decided to make it open-source as well. Intercom Conversation Stats is a Rails app which integrates with the Google and Intercom APIs, and uses Sidekiq to automate all of its processes. First, a webhook is sent from Intercom to the application whenever a new conversation is created by one of your users. Intercom Conversation Stats then stores the ID of that conversation in a table, so that conversation’s data can be accessed later. By default, at the end of the week, the application pulls the tags from each of this week’s conversations and counts how many times each tag appeared. 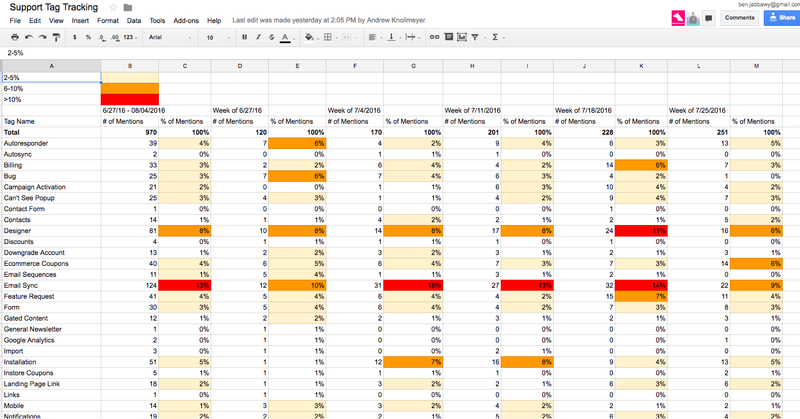 The count for each tag is then stored in its respective row in Google Sheets, along with the percent of tag mentions each tag accounted for. The GitHub repository can be accessed here. Instructions on setup and customization can be found in the README on that page.